It would be reasonable to assume National Beer Day doesn't exist. 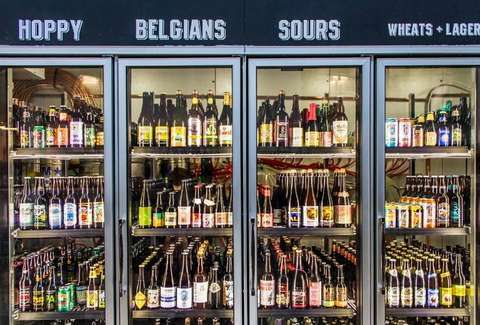 There's an unending parade of national food holidays, so it'd be fair to assume beer would get elbowed out and that no one needs an excuse to honor beer. However, there is a National Beer Day. It's celebrated every April 7, and there's actually a reason behind it. April 7 is the day the Cullen-Harrison Act was enacted after President Franklin D. Roosevelt signed it into law on March 22, 1933. The Act came at the end of Prohibition and allowed the sale of beer and wine with an ABV of 3.2% or lower. It's viewed as an important domino in the chain of events that led to the repeal of 18th Amendment and the prohibition of alcohol in the United States. It's not quite Repeal Day (December 5), but it's damn close. Here are a few ways you can spend your Saturday remembering the fine legislation of Pat Harrison and Thomas Cullen. The deal: The company that brings delicious beers to your doorstep is offering 10% off (up to $25) orders of Bud Light, Stella Artois, Goose Island, and Budweiser. The deal: The craft beer delivery service is running an absurd contest. Show they how many growlers you can hold and the winner gets that many growlers. Post a photo of yourself to Instagram holding as many growlers as possible and tag #growlercarry and @running.tap. Whoever has the most by midnight on Sunday wins that many growlers willed with beer. Only rules are that you can't use straps or anything to help you hold them. The deal: The home of a giant boot of beer is doling out a free round of beer after its 8pm keg tapping. You can also pick up half price bier cheese dip and chips. The deal: The Fort Collins-based tavern is getting in the spirit by handing out free pints from 4-8pm Saturday. You'll have more than beers to choose from, including beers from Odell, Funkwerks, and New Belgium. The deal: If you're traveling in or out of New York, you're in luck. Beers deals abound at Grand Central. Beer Table to Go is offering 20% off all beer for takeaway from Friday through Sunday. There are also alluring deals available at Café Spice, Grand Central Oyster Bar and Restaurant, The Bar at the Great Northern Food Hall, and Michael Jordan's Steakhouse NYC. The deal: The Mexican fast-casual chain is offering $2.50 domestic beer and $3.50 imported beers all day long. The deal: Grab happy hour pricing on Mexican beers all day in honor of the beer holiday. The deal: Grab a 22 oz. draft beer for $5. That's creeping up on being a full boot of beer. The deal: The brewery that abides German Beer Purity Laws is running an all-day happy hour at its taproom. You can grab $1 off pints and $2 off pitchers all day. The deal: In advance of the launch of its new taproom later this month, Bent Paddle is hosting a free dance party that will feature the release of its Pineapple Jalepeño Bent Hop. The deal: Since National Beer Day lands during tax season, all CPAs are getting a free pint of the brewery's Tax Day IPA at the Blue Point tasting room. Additionally, if you can prove you had to pay taxes this year, you get a free four-pack of Tax Day IPA when you buy another four-pack in the tasting room. The deal: In honor of repeal, the brewery is offering $2 off any brewed beer at both of its locations. The deal: The South Dakota brewery is offering $2 off pints and talls in the taproom all day. The deal: Firkin Fest isn't a taproom, but the event hosted at St. Paul's Happy Gnome will feature tons of local breweries showcasing more than 60 new and hard-to-find beers. Breweries involved include Surly, Indeed, Bent Paddle, Sociable Cider Works, and a handful from out of state as well. The deal: Enjoy a pint in the brewery's test taproom and get a feel for how the brewery will look when it officially opens later this year. You'll get a taste of some of the new beers brewed by Guinness on-site such as the Black IPA and the Guinness IPA. The deal: Okay. This isn't really a deal, but it's definitely something weird you can do for National Beer Day. Metazoa is hosting bunny yoga in the taproom. Bunny yoga is like goat yoga with bunnies. What's that? Oh. Goat yoga is like regular yoga with goats. The deal: The brewery is celebrating its two-year anniversary on Saturday from 1-9pm. For just $20, you get into the party, and you get an eight-ounce Southern Craft souvenir glass and six beer pours. The deal: One of Minnesota's best breweries celebrates National Beer Day with a limited edition Repeal Day poster, which was designed by Ross Bruggink this year. It's available in the Summit taproom. Additionally, the brewery will tap a Summit Oatmeal Stout cask with Cherry Cordial. The deal: The Bloomington-based brewery is headed to Indianapolis to host the 7th annual Sour Wild Funk Fest which features more than 50 brewers showcasing more than 150 sour, funktastic beers. Brewers include Mikkeller, Collective Brewing Project, 3 Floyds, Bell's, Schell's, Brooklyn Brewery, New Belgium, and many others. The deal: Applebee's is offering $1 margaritas -- or Dollaritas -- every day in April, which includes National Beer Day. It's not beer, but it is a cheap drink. The beer gods would approve. The deal: This fest features more than 20 brewers and your $15 ticket features up to three samples from each brewery up to 24 beer samples. 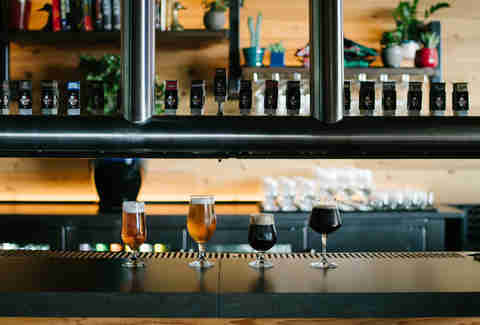 The deal: The spot that lays claim to the beer holiday is offering 100 bonus points to its loyalty program members on each purchase for National Beer Day. The deal: This is obviously not a deal, but Viceland is running a marathon of Beerland, its show about homebrewing. If you know of National Beer Day freebies and deals we missed, email us at news@thrillist.com and we'll add 'em here.